I love to find ways to excite children about writing (and reading, and learning! ), therefore many of my Prompts tend to relate to writing, at least in part. Yet I certainly don’t think that creating with words is the only, or the best, way to create. What I hope is that children can start with one of my prompts, then play around with it until they grab a spark, and take off with an idea. Some of the prompts I’ve come up with have led children to create in paint, in fabric, by cooking, by sculpting, through choreography and photography. I brainstorm a couple of ideas, but then it’s up to kids to brainstorm more, and choose one they like. They might start with the idea of a map, decide to create one on paper, then go on to compose a piece of music about it, or invent a character who holds the map for a story they plan to write. Below today’s post, you’ll also find an embedded List of all my prompts to date. * Today’s prompt asks you to start with a map. What map? Explore a website with old maps and choose one. Invent a character who will go on a journey. Plan the route your character takes. Why does he go on the journey? What problems does she face? How will the story be resolved? * Plan your journey around the world and draw it on National Geographic’s Map Maker. * Use the markers at the same website to show places you would like to visit in Australia. * Blob some paint onto paper and fold the paper in half, smoothing the paint out but not squishing it out. Open up the paper and imagine the painted part is your map of your very own island. Add the details you would like to have on and around your island with pencils or paint. * Find some sand or dirt where you’re allowed to play and create a 3D map of your school playground. What found objects can you use to represent the buildings? the trees? the grass? the cricket pitch etc? * What if someone swallowed a map? Why might such a thing have happened? What happens next? * Find an old map that nobody wants. Use the map as a background for some art or craftwork. You might find inspiration here. * Draw your own map of an island. As you draw, think about who might live on the island. Who created this map? What’s it for? See if a story comes to mind and write it down. * Choose a country you would like to find out more about. What do you know about this country already? What would you like to know about it? Draw a map of the country. Label your map with places of interest to you. Create a brochure, persuading others to visit this country. 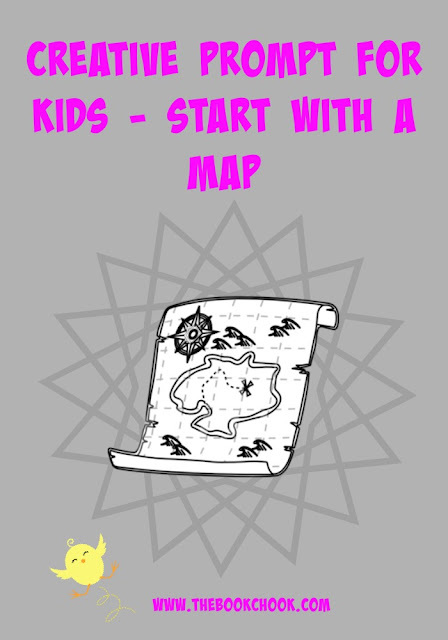 * Hide some treasure and create a map that gives clues so someone else can find your treasure. * Invent a fantasy land and draw its map. * Explore green mapping with your class and consider making a green map in your local area.